These exquisite table linens feature embroidered butterflies, wildflowers, greenery and scrolled designs on a white background. Intricate cutwork and scalloped edges provide the finishing touch. Perfect on their own or with a coordinating tablecloth underneath (sold separately). Machine washable polyester; imported. Available in Runner (67 1/2"L x 13 3/8"W) or Square (33 1/4"Sq.). 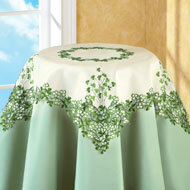 These lovely table linens will dress up your St. Pat's tables with a touch of seasonal elegance. Each features exquisite embroidery and lacy openwork, along with gorgeous green shamrock detailing. Polyester. Machine wash. Available in Square (34" Sq.) or Runner (68"L x 13"W). 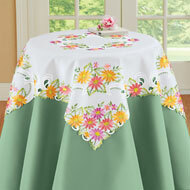 Beautifully embroidered daisies, greenery and detailed cutwork create an intricate border on these lovely table linens. 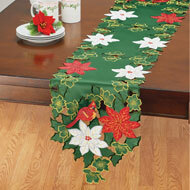 Choose runner or square table topper to brighten your seasonal décor. Use alone or with a coordinating tablecloth underneath (sold separately). Machine wash. Polyester; imported. Available in Runner (68" x 13 1/2") or Square (33 1/2"Sq.). These exquisite table linens feature beautifully embroidered daisies tied with a yellow ribbon against a white background. Intricate cutwork and scalloped edges provide the finishing touch. Perfect on their own or with a coordinating tablecloth underneath (sold separately). Machine washable polyester; imported. Available either as a Runner (69" x 12 1/2W") or a Square (33 1/2"Sq.). 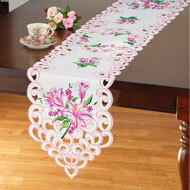 Dress your tables for Spring with these delightful linens. Charming daisies and colorful tulips are beautifully embroidered atop a cream background. Intricate cutouts along the edges are the perfect finishing touch. Perfect on their own or with a coordinating tablecloth underneath (sold separately). Hand wash. Polyester; imported. Size available in Runner (69" x 12 3/4") or Square (34 1/2"Sq.). Beautifully embroidered, brightly colored lilies & detailed cutwork create an intricate border on these lovely table linens. 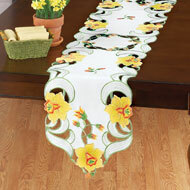 Choose runner or square table topper to easily brighten your springtime décor. Perfect to use alone or with a coordinating tablecloth (sold separately). Polyester; imported. Machine wash. Available in Runner (68 1/4"L" x 12 3/4"L") or Square (34"Sq.). These elegant ivory linens feature intricate details, scroll designs and beautifully embroidered birds perched atop flowering branches. Available as a runner or table square, they look pretty on their own or with a coordinating tablecloth underneath (sold separately). Machine wash. Polyester; imported. Available in: Runner (68" x 12 3/4") or Square (34"Sq.). 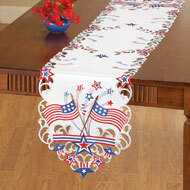 Dress your tables with patriotic pride! These festive table linens feature colorful embroidery, detailed openwork, and flagthemed birdhouses atop a white background. Perfect on their own, or with a tablecloth (sold separately) underneath. Machine wash. Polyester; imported. Available as a Runner (68 1/4" x 13") or a Square (34 1/4"Sq.). 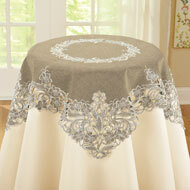 These beautiful linens dress and protect your table with elegant style. 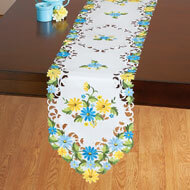 The stunning design features embroidered daisies atop a white background with plenty of intricate cutouts. Set of 3 Doilies and Table Runner are sold separately. Machine wash. Polyester; imported. 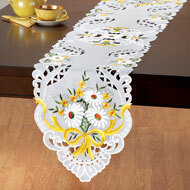 Available in Runner (69" x 13 1/2") or Set of 3 Doilies (11 1/2", 8" and 6"Dia.). Put your patriotic pride on display with these festive table linens that feature exquisite embroidery, lacy openwork, red, white and blue butterflies and flowers atop a white background. Perfect on their own, or with a coordinating tablecloth (sold separately) underneath. Machine wash. Polyester; imported. Choose: Runner (68" x 12 3/4") or Square (34"Sq.). Beautiful white linens feature lovely cutwork details, embroidered blue and yellow flowers, greenery and stunning butterflies. Available as a runner or a square, the linens are perfect on their own or with a coordinating tablecloth underneath (sold separately). Machine wash. Polyester; imported. Size available in Runner (69 1/2" x 12 3/4") or Square (34"Sq.). These embroidered toppers feature yellow, lilac and blue flowers topped with a bow on a white background. 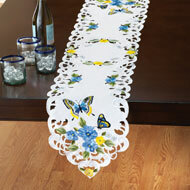 Butterflies and beautiful scrolling cutwork are the perfect finishing touches. 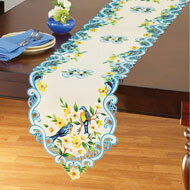 Available as a runner or square, each is terrific on its own or with a tablecloth underneath (sold separately). Machine washable polyester; imported. Size available in Runner (68" x 13") or Square (33 1/2"Sq.). These lovely table toppers feature beautiful yellow daffodils and greenery atop a white background. 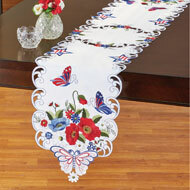 Available as a runner or square, each has exquisite embroidery and intricate cutwork details. Terrific on their own or with a coordinating tablecloth underneath (sold separately). Machine washable polyester; imported. Available in Runner (68"L x 13 1/2"W) or Square (34"Sq.). 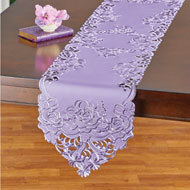 These beautiful creamy white table linens feature intricate cutwork and lovely embroidered roses in shades of purple. Perfect on their own or over a coordinating tablecloth (sold separately). Machine wash. Polyester; imported. Choose: Runner (70" x 13 1/2") or Square (34"Sq.). Intricately embroidered roses, daisies, leaves, scrolling designs and delicate cut work make these beautiful linens the perfect way to dress your tables. 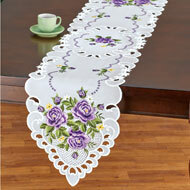 Choose solid white or lavender design in a runner or table square. Perfect alone or with a tablecloth underneath (sold separately). Machine wash. Polyester; imported. Choose: Lavender or White. 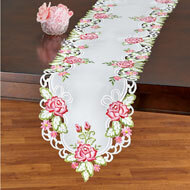 Available in: Runner (69" x 13 1/4") or Square (34"Sq.). Dress your table in elegant style. These beautiful white linens feature intricate cutwork, scalloped edges and lovely embroidered roses in shades of pink. Perfect on their own or over a coordinating tablecloth (sold separately). Machine wash. Polyester; imported. Choose: Runner (68 1/4" x 13") or Square (34"Sq.). These beautiful white linens feature intricate cutwork, scalloped edges and lovely embroidered roses in shades of pink and yellow daisies. Perfect on their own or over a coordinating tablecloth (sold separately). Machine wash. Polyester; imported. Available in Runner (69 1/2"L x 13"W) or Square (34 1/2"Sq.). Exquisitely embroidered toppers feature beautifully detailed peacocks perched on a flower covered branch on an off white background. Intricate cutwork throughout and scalloped edges are the perfect finishing touch. 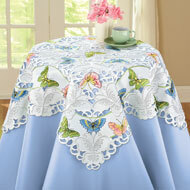 Linens are lovely on their own or with a coordinating tablecloth underneath (sold separately). Machine washable polyester; imported. Size available in Runner (67 1/4"L x 13 1/4"W) or Square (34" Sq). Elegant embroidered toppers feature beautifully detailed lace borders in tan and white. 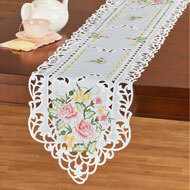 The lovely lace design in the center of the white background is the perfect finishing touch. 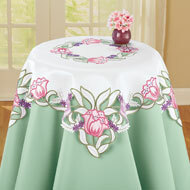 Linens can be used alone or with a coordinating tablecloth underneath (sold separately). Machine washable polyester; imported. Size available in Runner (68"L x 13 1/2"W) or Square (36"Sq.). Beautiful embroidery and intricate details make these table linens a gorgeous way to add a splash of color to your home. 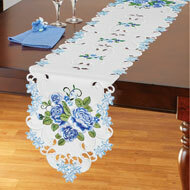 The bright white linens feature intricate cutwork details and lovely blue embroidered roses. Machine wash. Polyester; imported. Available in: Runner (68" x 13") or Square (34"Sq.). 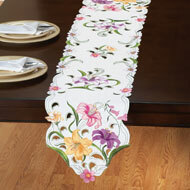 Beautiful embroidery and intricate cutouts make these table linens a beautiful way to decorate your tables. Each features a white background with embroidered hummingbirds and flowers, and is perfect on its own or with a coordinating tablecloth underneath (sold separately). Machine washable polyester; imported. Available as a Runner (67 3/8"L x 13 1/4"W) or a Square (34"Sq.). 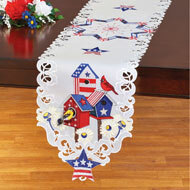 Table linens feature exquisite embroidery, lacy openwork, stars and flagthemed designs atop a white background. Perfect on their own, or with a tablecloth underneath (sold separately). Great for the 4th of July or celebrating your patriotic pride all season long. Machine wash. Polyester; imported. Available either as a Runner (68"L x 13"W) or a Square (34 1/2"Sq.). Elegant embroidered toppers feature beautifully detailed floral and scroll designs on a tan background. Intricate cutwork throughout is the perfect finishing touch. Linens can be used alone or with a coordinating tablecloth underneath (sold separately). Machine washable polyester; imported. Size available in Runner ( 68"L x 13 1/2"W) or Square (34" Sq). These beautiful linens are the perfect way to dress your table with elegant style. The stunning design features embroidered daisies atop a yellow background with intricate cutout details. Set of 3 Doilies and Runner are sold separately. Machine wash. Polyester; imported. 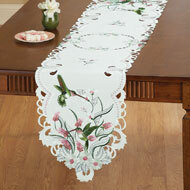 Choose Runner (68 1/2" x 13 3/4"), or Set of 3 Doilies (6"Dia., 8"Dia., 11 1/2"Dia.). With beautifully embroidered daisies in shades of blue and yellow, these lovely linens are a great way to update your tables. Intricate scroll cutwork and a pretty leaf design are the perfect finishing touches. Machine wash. Polyester; imported. 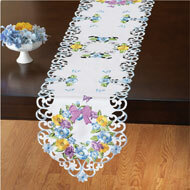 Available in Doilies (5 3/4", 7 1/2" & 11 1/4"Dia) or Runner (69 3/4"L x 13"W). 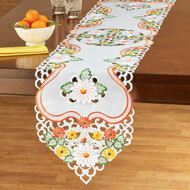 Beautiful embroidery and intricate cutout details make these table linens a lovely way to decorate your home. 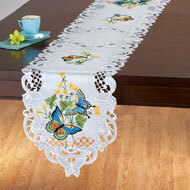 Each features lacy openwork, scalloped edges & embroidered butterflies on a white background. Machine wash. Polyester; imported. Size available in Runner (68"L x 13"W) or Square (34"Sq.). Beautiful embroidery and intricate cutout details make these table linens a lovely way to decorate your home for the season. Each features lacy openwork, scalloped edges and embroidered pumpkins, Fall leaves, sunflowers, lilies and a cross on a white background. Available in a runner or square. Machine wash. Polyester; imported. Size available in Runner (69"L x 13"W) or Square (34"Sq). 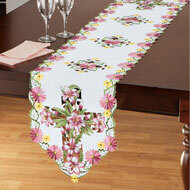 These lovely table linens feature a cross made of beautifully embroidered lilies and colorful daisies around the edges. 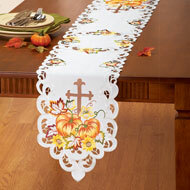 Choose runner or square table topper to easily brighten your décor. Perfect to use alone or with a coordinating tablecloth (sold separately). Polyester; imported. Machine wash. Choose: Runner (69" x 13") or Square (33 1/2"Sq.). The white linens have intricate cutwork details and exquisitely embroidered lilies in shades of pink with greenery and scroll designs. Available as a runner or table square, they look great on their own or with a coordinating tablecloth (sold separately). Machine wash. Polyester; imported. Choose: Runner (68" x 13 1/4") or Square (34"Sq.). 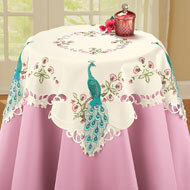 These beautiful linens dress and protect your table with elegant style. 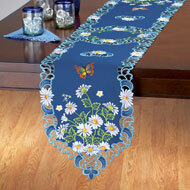 The stunning design features embroidered daisies and butterflies on a blue background. Intricate cutout details are a lovely touch. Set of 3 doilies and table runner are sold separately. Machine wash. Polyester; imported. Available in Doilies (10 3/4, 7 3/4 and 5 5/8"Dia.)  Set of 3 or Runner (67 1/2"L x 13"W). 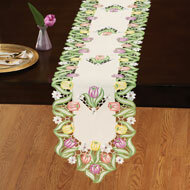 Embroidered toppers feature pink tulips and purple flowers with greenery against a creamy white background. Intricate cutwork along the borders is the perfect finishing touch. Linens are lovely on their own or with a coordinating tablecloth underneath (sold separately). Machine washable polyester; imported. Size available in Runner ( 68 1/4"L x 13"W) or Square (34" Sq).